Reduces pain, inflammation and swelling WHILE healing the source of the pain. Improves joint mobility and flexibility. Scientifically proven to work through medical research studies. "I Give It My Strongest Recommendation"
- Dr. Robert Thompson, M.D. "This Stuff Save My Life"
The word systemic means whole body and systemic enzymes operate throughout your body in every system and organ. Enzymes, which are known as biocatalysts - something that makes something else work or work faster. Enzymes are basically the main line of defense against inflammation. Enzymes are NOT anti-inflammatory drugs but rather reduce inflammation by neutralizing the bio-chemicals of inflammation to levels where the creation, repair and regeneration of injured tissues can take place. Reducing inflammation can have immediate impact on improved heart health, cancer prevention and recovery, and Alzheimer's prevention. It also helps speed up recovery from sprains, strains, fractures, bruises, contusions, surgery and arthritis. Unlike NSAID's (like Aspirin, Ibuprofen and prescription pain medications) which may give only temporary relief and do not fix the underlying cause of the problem, systemic enzymes work to reduce the inflammation and promote healing without any side effects. A study published in the Journal of Medicine, Science, Sports and Exercise found that "Proteolytic Enzymes have therapeutic effects in the treatment of inflammation and soft tissue injuries." And in a study done by Dr. Nicholas Gonzales, which was published in the medical journal, Nutrition and Cancer, Dr. Gonzales compared systemic enzyme therapy against a new cancer drug, Gemcitabine. He found that 5 out of 11 patients treated with systemic enzymes lived two years or longer and not a single patient of the 129 treated with the drug lived more than 19 months! So, as you can see, not only is systemic enzyme therapy safe and effective, but also it's often more effective than the drugs. ...Break down scar tissue and fibrosis - Fibrosis is scar tissue that builds up in our bodies and over time creates some much restriction and strain on our organs that they can no longer function. Well, systemic enzymes eat away that excess build up of fibrin and scar tissue. Doctors throughout Europe and Asia have been using them for over 50 years to remove scar tissue from surgical wounds, kidney fibrosis, pulmonary fibrosis and in numerous other scenarios. Maintain a healthy immune system - enzymes are adaptogenic and they work to restore the body's balance. When the immune system is low and we become more susceptible to infections, the enzymes clean the blood to help fight off infection. And if the immune system is too ramped up, as with auto-immune diseases, the enzymes work to tone down the immune system and eat the antibodies that are attacking the healthy tissue. Red Blood Cells getting stuck in and amongst fibrin. This happens when there aren't sufficient proteolytic enzymes in the blood stream. If you suffer from any sort of ache or pain, or if you just want to get and stay as healthy as possible, I urge you to consider systemic enzymes. They have been used to safely and effectively eliminate pain and inflammation from all sorts of conditions like arthritis, colitis, back pain, sciatica, joint pain, heart disease, cancer and more. 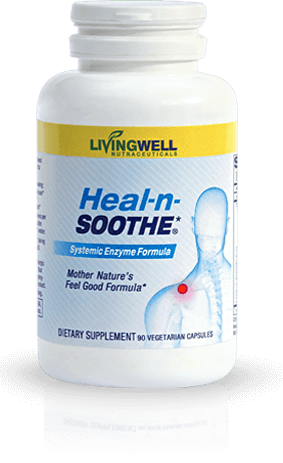 The pain reducing powers of Heal-n-Soothe® have been proven to be highly effective in numerous clinical studies. For example, in one study, 77 patients taking 400mg/day of Bromelain experienced significant reduction in pain and swelling. A recent study done at the prestigous Sloan-Kettering Cancer Research Center in New York found that Turmeric was more safe and precise than asprin in stopping inflammation by shutting down the COX2 enzyme responsible for pain. But Turmeric caused none of asprin's typical gastrointestinal irritation. 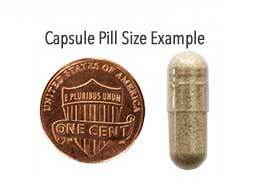 In a randomized, double-blind, placebo controlled study, 30 patients received 333mg, 3x a day of Boswelia. The group who received the Boswelia had a significant reduction in pain and swelling and experienced an increase in joint mobility and flexibility as compared to the placebo group. And these are just a few of the hundreds of studies that have been done to prove the effectiveness of these ingredients. On their own, each of these ingredients have been proven through both clinical studies and thousands of years of use, to be safe and effective. But together, they work synergistically to quickly reduce inflammation and pain. And unlike prescription and over-the-counter NSAID's, Heal-n-Soothe® works without the dangerous and harmful side effects. Heal-n-Soothe® not only has the most powerful combination of natural anti-inflammatory and pain relieving ingredients, but it also has the strongest and highest potency of any proteolytic enzyme formulation available! Studies have shown that it reduces inflammation by blocking both the COX-2 and 5-LOX enzymes which create pain. In addition, Turmeric's antioxidant powers work to seek out and destroy free radicals in the body which contribute to pain and swelling. Papain supports a healthy immune system and contains a wide range of proteolytic enzymes that break down proteins. In studies it’s been shown to promote the healing of damaged tissue and to help maintain a healthy digestive tract. Another time-tested natural pain reliever, Devil's Claw has been used for hundreds if not thousands of years in Africa. Numerous studies have proven it's effectiveness in reducing pain and inflammation. In fact, one study found that Devil's Claw was as effective in treating arthritis pain as a commonly prescribed anti-inflammatory drug. "This Stuff Is God In A Bottle"
"It Has Given Me My Life Back"
"The KEY that made me well again"
It is possible that you may experience the following effects on the body. *These statements have been evaluated by the Food and Drug Administration. THis product is not intended to diagnose, treat, cure or prevent any disease. If you are pregnant, nursing, taking medication, or have a medical condition, consult your physician before using this product. With your free trial order today, you are receiving a full 90-count bottle of Heal-n-Soothe®(a $59 value) for FREE… just pay a small shipping fee. ($9.95 U.S. or $19.95 International). If you love the way Heal-n-Soothe works for you, do nothing and you’ll be enrolled in our SmartShip program. 30 Days from now, you’ll automatically receive a fresh bottle every month for the low Members Only price of just $49.95. That's a permanent savings of 33% OFF the regular price, plus you get FREE SHIPPING for life! You are under NO obligation to continue beyond your first FREE bottle. You can pause, change the frequency or cancel your SmartShip subscription at any time, quickly, and easily by calling 800-216-4908, or cancel online. There’s NO RISK and you are protected by our 90-day, MONEY BACK GUARANTEE. You’ll be guaranteed the low, members only price of just $49.95 per bottle… even if we raise the price in the future.